Basics-IT’S TIME FOR DIVINE WAR! 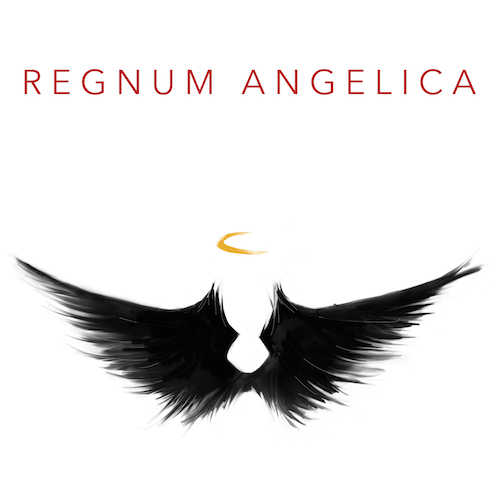 Regnum Angelica is a battle between the forces of heaven and hell played out on an epic scale. Each player takes a side represented by a deck of cards. These cards come in three types: angels, angelic scripts, and pillars. Angels are the bulk of the cards in the deck. These represent the attacking forces for each side. They have a movement range and a power rating. If you move the angel all the way across the field into your opponent’s side, you gain points equal to their power. Also, if you score points with an angel/demon, you will lose all your power, which gets you movement for your angels and points to spend to cast scripts. Scripts are best thought of as instant spells from Magic: The Gathering. After paying the power cost for the card, each script has an immediate effect inducing more movement, teleporting angels, removing angels from the field, or other options. Pillars increase your angel’s/demon’s power, and change the type of angel until they are removed. They also give your angel/demon a shield as an angel/demon that is defeated in combat with a pillar just has the pillar removed instead of losing the whole angel/demon. Each turn is very simple. 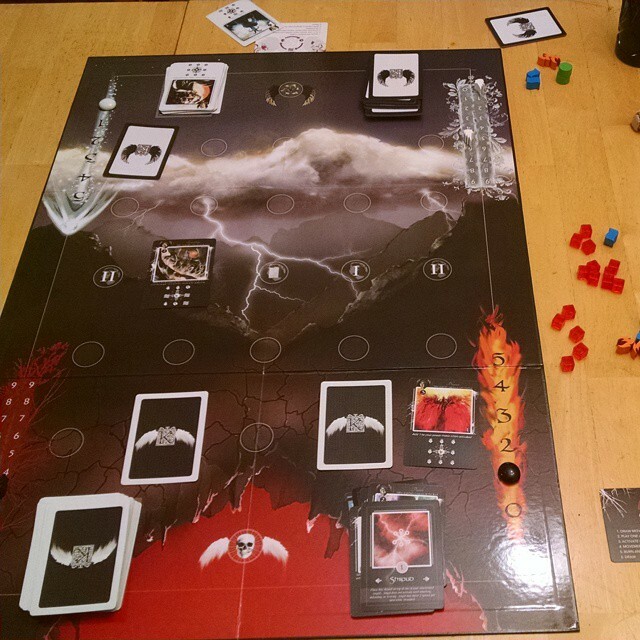 First a player gains a number of movement tokens equal to their current power or one token. Then, a player may play one angel face down. Next, a player can turn one face down angel/demon face up. Some angels have abilities that range from gain power, reduce your enemy’s angel count, or other abilities and these trigger when they are turned face up. The active player can then spend movement tokens to move angels up to their movement range. Unspent tokens are removed at the end of turn. The last action a player can do is discard pillars and angelic scripts to gain extra power equal to the cost of using the card. At the end of your turn, you draw up to four cards or one card if you have four or more cards. The above is simple, but what makes it interesting is the way combat is resolved between cards. Each card has a grid indicating element and directions. Angels and demons can move in eight directions (up, down, right, left, and all diagonals). At each of these locations on the mini grid on the card is an element symbol. When a card would move on top of another card, you compare the elements and directions of those cards. The three elements are earth, water, and fire. Earth beats water; water beats fire, and fire beats earth. It’s like a quick, stylized version of rock paper scissors. If the two elements are the same, then the angel/demon with the higher rank wins. If that’s tied, then both are destroyed and move to the void. Pillars come into play here as a pillar effectively makes all the symbols on an angel/demon’s directions that element. Turns go back and forth until one player scores 35 points, and that player’s side is victorious!